"Jewelry to me is a wearable collage." "In many ways, jewelry making is like painting, except my palette contains metal parts and an array of semiprecious stones." Jan Michaels is a San Francisco artist and designer. The main concept is antiquity and the essence of mysticism. That is, each piece is original, yet feels ancient with a modern sense of wearablity. 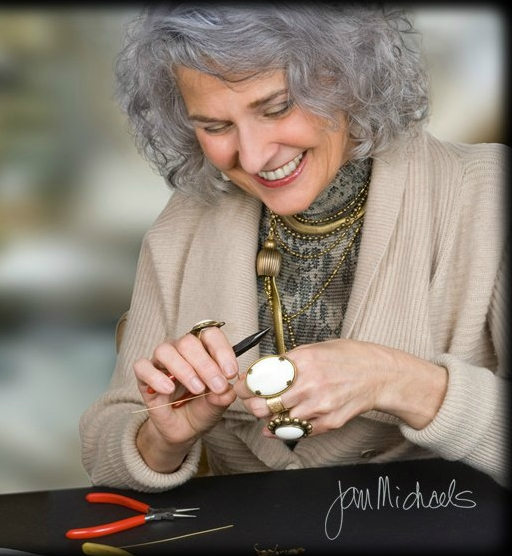 Jan Michaels jewelry is created by combining stampings, chains, antique glass beads and components, semi-precious stones, African beads and brass findings. The skilled crafts women in her studio rivet pieces together, hand wire wrap individual beads and link parts together with jump rings. All designs are original creations made to last and become antiques of the future.